A view of Lake Travis from Lucy's on the Lake on Oct. 16. At a press conference today, LCRA General Manager Phil Wilson called the rise in lake levels "historic." 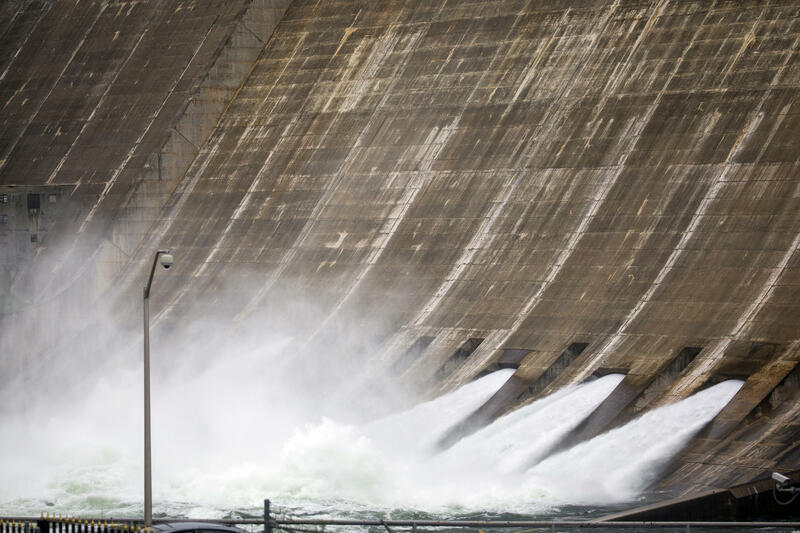 The authority opened four floodgates on Mansfield Dam to release water from Lake Travis, which is 134 percent full. Wilson said LCRA likely will need to open four more by midday Thursday. Eight open floodgates would be a record at Mansfield, surpassing a 1957 record of six gates. Wilson said LCRA estimates Lake Travis took on more water in a week than the entire city of Austin would use in four years, rising 21 feet from noon yesterday to noon today. LCRA began releasing upstream floodwaters from its dams on the Highland Lakes yesterday, after rainfall and historic flooding in parts of the Hill Country west of Austin along the Llano River. Floodgates are open at Buchanan, Wirtz, Starcke, Mansfield and Tom Miller dams along the Highland Lakes. Water is being directed through the spillway at Inks Dam, which has no floodgates. The Lower Colorado River Authority opened floodgates at the Mansfield Dam to release water from Lake Travis, which is 134 percent full. LCRA's forecast suggests water levels at Lake Travis could rise to 705 to 710 feet above sea level. The all-time record for lake levels at Travis was set in 1991 during flooding on Christmas Day, when the lake topped out at 710.44 feet above sea level. Around 7:15 p.m. Wednesday, Lake Travis was just over 698 feet above sea level. The lake could reach as high as 700 feet. 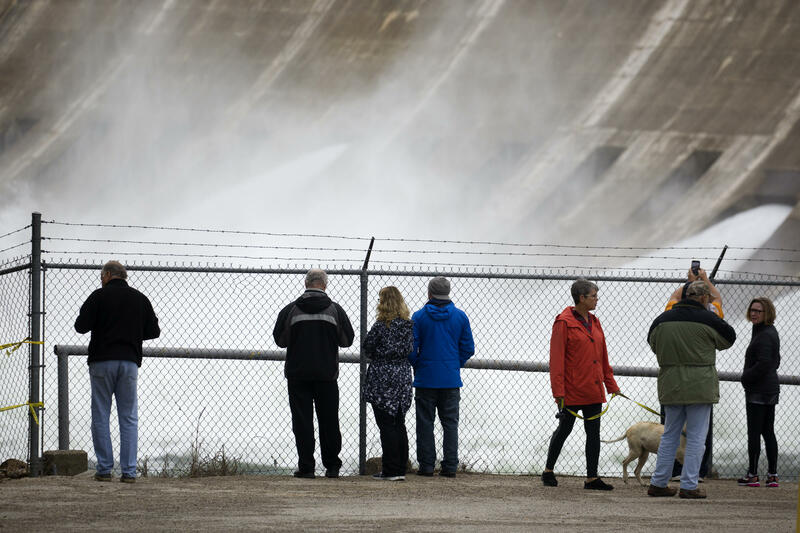 A crowd watches water pour through the Mansfield Dam. The LCRA closed lakes Travis, Marble Falls, LBJ, Inks and Buchanan until further notice, and the Austin Fire Department has issued a ban on recreation in Austin waterways – including Lady Bird Lake, Lake Austin, Barton Springs Pool and the Barton Creek Greenbelt. The Colorado River in Austin is nearly 5 feet shy from flood stage, but the National Weather Service does not forecast the river to rise much higher. The service forecasts as much as 2 inches of rain in parts of Central Texas through Friday. Texas Gov. Greg Abbott has issued a state of emergency in 18 counties in Texas as a result of the flooding – including Travis, Bastrop, Burnet, Williamson and Llano. The Llano River reached historic levels of flooding Tuesday, prompting officials in Marble Falls to order evacuations and open shelters for displaced residents.